The 10 Mahavidyas are Wisdom Goddesses, who represent a spectrum of feminine divinity, from horrific goddesses at one end, to the gentle at the other. Mahavidyas (Great Wisdoms) or Dasha-Mahavidyas are a group of ten aspects of the Divine Mother Durga or Kali herself or Devi in Hinduism. The 10 Mahavidyas are Wisdom Goddesses, who represent a spectrum of feminine divinity, from horrific goddesses at one end, to the gentle at the other. The Goddess as Guide and Protector, or Who Saves.Who offers the ultimate knowledge which gives salvation (also known as Neel Saraswati). tara meaning “star”. As the star is seen as a beautiful but perpetually self-combusting thing, so Tara is perceived at core as the absolute, unquenchable hunger that propels all life. The Goddess Who is “Beautiful in the Three Worlds” (Supreme Deity of Srikula systems) or Beautiful Goddess of the Three Cities; the “Tantric Parvati” or the “Moksha Mukta”. As Shodashi, Tripurasundari is represented as a sixteen-year-old girl, and is believed to embody sixteen types of desire. Shodashi also refers to the sixteen syllable mantra, which consists of the fifteen syllable (panchadasakshari) mantra plus a final seed syllable. The Goddess as World Mother, or Whose Body is the Cosmos. The Queen of the Universe. Bhuvaneshwari means the Queen or ruler of the Universe. She is the Divine Mother as the Queen of all the worlds. All the Universe is her body and all beings are ornaments on her infinite being. She carries all the worlds as a flowering of her own Self-nature. She is thus related to Sundari and to Rajarajeshwari, the supreme Lady of the Universe. She is capable of turning situations according to her wish. It is considered that even the navagrahas and Trimurti cannot stop her from doing anything. She is also called Shubhamkari, good mother to good people and terrible to bad ones. She is seen holding book, rosary, and making fear-dispelling and boon-conferring gestures. 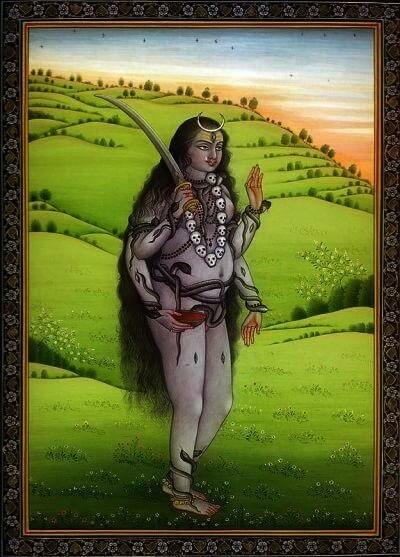 She is also known as Baala or Tripurabhairavi. 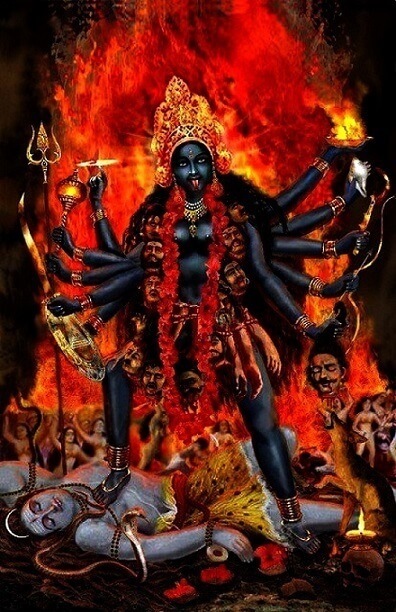 It is believed that when Bhairavi entered the battle field, her horrible appearance made the demons become weak and very feeble, and it is also believed that most of the demons started panicking as soon as they saw her. Bhairavi is seen mainly as the Chandi in the Durga Saptashati version of slaying Shumbha and Nishumbha. 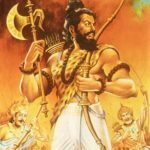 However, she kills and drinks the blood of Chanda and Munda the Chieftains of asuras, so the Goddess Parvati gives her a boon that she would be called Chamundeshwari. Chhinnamasta can be easily identified by her fearsome iconography. The self-decapitated goddess holds her own severed head in one hand, a scimitar in another. Three jets of blood spurt out of her bleeding neck and are drunk by her severed head and two attendants. Chhinnamasta is usually depicted standing on a copulating couple. Chhinnamasta is associated with the concept of self-sacrifice as well as the awakening of the kundalini – spiritual energy. She is considered both as a symbol of self-control on sexual desire as well as an embodiment of sexual energy, depending upon interpretation. 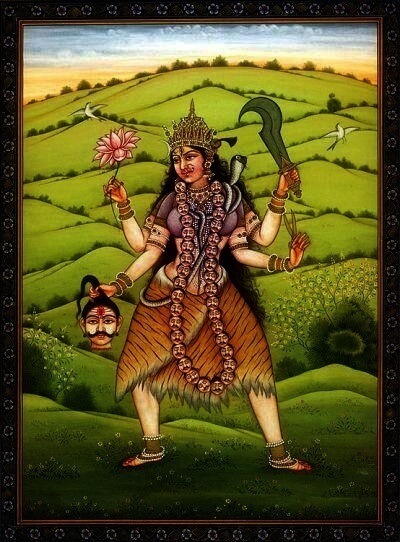 She symbolizes both aspects of Devi: a life-giver and a life-taker. Her legends emphasize her sacrifice – sometimes with a maternal element, her sexual dominance and her self-destructive fury. 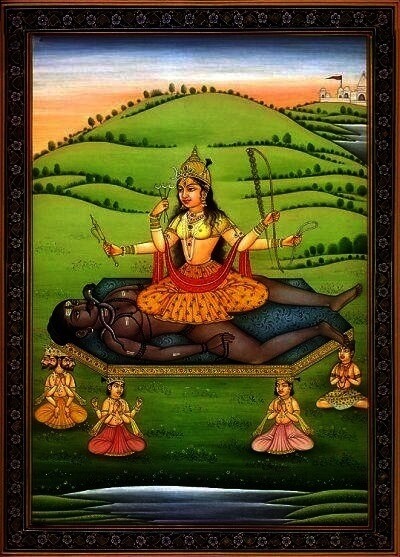 Dhumavati: The Widow Goddess,or the Goddess of death. She is often portrayed as an old, ugly widow, and is associated with things considered inauspicious and unattractive in Hinduism, such as the crow and the Chaturmas period. The goddess is often depicted on a horseless chariot or riding a crow, usually in a cremation ground. Dhumavati is said to manifest herself at the time of cosmic dissolution (pralaya) and is “the Void” that exists before creation and after dissolution. She is often called tender-hearted and a bestower of boons. 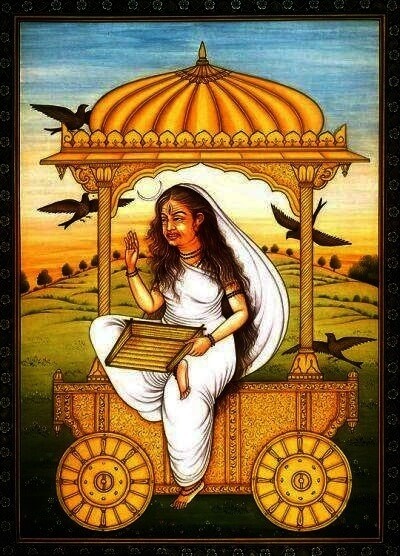 Dhumavati is described as a great teacher, one who reveals ultimate knowledge of the universe, which is beyond the illusory divisions, like auspicious and inauspicious. Her ugly form teaches the devotee to look beyond the superficial, to look inwards and seek the inner truths of life. Dhumavati is described as a giver of siddhis (supernatural powers), a rescuer from all troubles, and a granter of all desires and rewards, including ultimate knowledge and moksha (salvation). Bagalamukhi Devi smashes the devotee’s misconceptions and delusions (or the devotee’s enemies) with her cudgel. 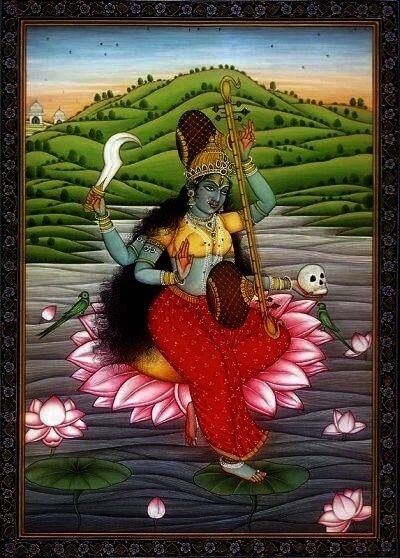 She is considered to be the Tantric form of Sarasvati, the goddess of music and learning. 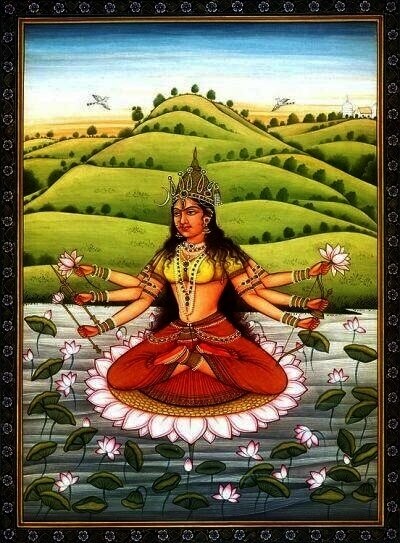 Like Sarasvati, Matangi governs speech, music, knowledge and the arts. Her worship is prescribed to acquire supernatural powers, especially gaining control over enemies, attracting people to oneself, acquiring mastery over the arts and gaining supreme knowledge. Kamalatmika has a golden complexion. She is being bathed by four large elephants, who pour kalashas (jars) of amrita (nectar) over her. She has four hands. 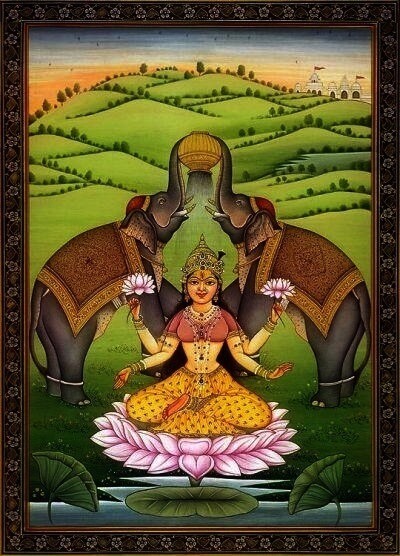 In two hands, she holds two lotuses and her other two hands are in abhayamudra (gesture of giving assurance) and varamudra (gesture of conferring boons) respectively. She is shown as seated in padmasana (lotus posture) on a lotus, symbol of purity. The name Kamala means “she of the lotus” and is a common epithet of Goddess Lakshmi. 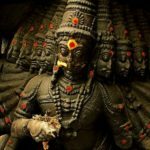 Lakshmi is linked with three important and interrelated themes: prosperity and wealth, fertility and crops, and good luck during the coming year. Image credits to the real artists. The hindu FAQs does not own any Images.